In your homeschool classroom this Thanksgiving, take a break from the traditional math concepts to break out the rulers and go on a mission to see how things in your home measure up. Dig out all of your rulers, yard sticks and measuring tapes to compare what all is listed on them. 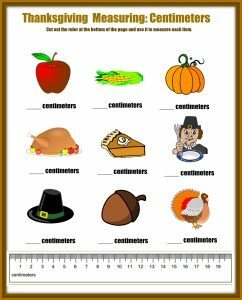 For these Free Thanksgiving Measuring Printables we are working in only inches and centimeters, but it is a great time to talk to your kids about how there are many different types of units of measurement. Grab the scissors and print out the Centimeter & Inches Measurements Printables. Have your kids cut the printed ruler off the bottom of the page and measure each item as shown. Record their findings below each image. For older children you can talk about how many centimeters versus how many inches are listed on the ruler. You may even want to spend time telling them a little about how the metric system differs slightly in measurements than our more commonly used method of inches. If you have teenagers in your homeschool classroom, you can even have them help with their younger siblings as part of their own class work. They can go over the different reasons the United States has not fully adopted the metric system. Grab your sensory bin and use these rulers, other rulers you gathered, to measure the items you have in your Fall or Thanksgiving themed sensory bin. Popcorn kernels will be one of your smallest measurements. Feathers or leaves may be much larger. Talk to your children about how everything can be broken down into measurements. For boys that like to help Dad with things around the house, you might even want to get out the screwdrivers, drill bits and similar to compare and show how some are listed as metric and other inches. These are also great household items for your child to have fun measuring with their ruler. As a final experiment, you can line your kids up against the wall and use a tape measure to measure their height in both inches and centimeters to record in their lessons. Working with measurements can be tons of fun and offer many different ways to incorporate into not just mathematics, but other areas of the homeschool classroom.